Engineering students from Queen's University Belfast have set a new world record with a 100ft footbridge made from Meccano. The temporary Meccano bridge has been built across Belfast's Clarendon Dock. It was unveiled at a free public event on Saturday. 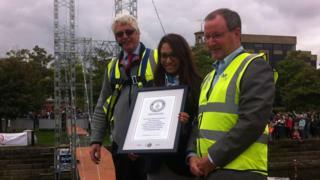 Representatives from Guinness World Records were on site to confirm it has set a record for the world's largest ever Meccano construction. The bridge was designed and built by a group of third year civil engineering students and school children. The year-long project is part of the university's outreach programme to encourage more children to think about careers in STEM (science, technology, engineering and mathematics). Media captionThe temporary Meccano bridge has been built across Belfast's Clarendon Dock. Around 11,000 pieces of Meccano were used to build the bridge, which weighs 600kg (about 1,300lbs). Dr Danny McPolin from the school of Planning, Architecture and Civil Engineering, who led the project, said: "If you count all the nuts and bolts and washers, there's approximately 70,000. "In terms of the longer pieces, if they're all laid out end-to-end I think it would be about 3.8kms - approximately 10,000 or 11,000 pieces. "So it's a lot of Meccano." He added: "We see this event not only as an opportunity to celebrate the students' and staff's incredible work over the past year, but also a chance to give local children an insight into the exciting courses on offer at Queen's. "We hope to welcome as many youngsters as possible on the day and cement their interest in studying civil engineering and other STEM subjects at university level." The project has received funding from the Department of Culture, Arts and Leisure, AECOM, Meccano and Queen's Annual Fund.